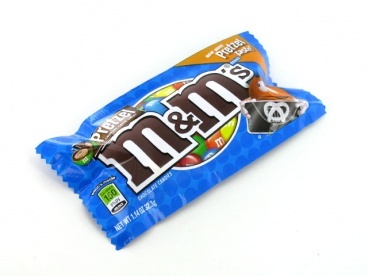 M&Ms with a crunchy, salty, sweet center. Milk Chocolate (Sugar, Chocolate, Skim Milk, Cocoa Butter, Lactose, Milkfat, Soy Lecithin, Salt, Artificial Flavors), Pretzel [Enriched Flour (Wheat Flour, Niacin, Reduced Iron, Thiamine Mononitrate, Riboflavin, Folic Acid), Salt, Food Starch-Modified, Vegetable Oil (Soybean Oil, Canola Oil And/Or Corn Oil), Malt, Leavening (Yeast, Sodium Bicarbonate, Ammonium Bicarbonate)], Sugar, Less Than 2%--Cornstarch, Corn Syrup, Dextrin, Coloring (Includes Blue 1 Lake, Red 40 Lake, Yellow 6, Red 40, Yellow 5, Blue 1, Yellow 6 Lake, Yellow 5 Lake, Blue 2 Lake, Blue 2), Gum Acacia. Allergy Information: May Contain Peanuts.